Nashville's embrace of temporary urban interventions is producing amazing results that are capturing the imagination of both locals and tourists alike. Many know Nashville as the ‘Music City’, but over the last decade Nashville has become ‘Crane City’ as almost a dozen construction cranes have continually lined the city’s skyline. 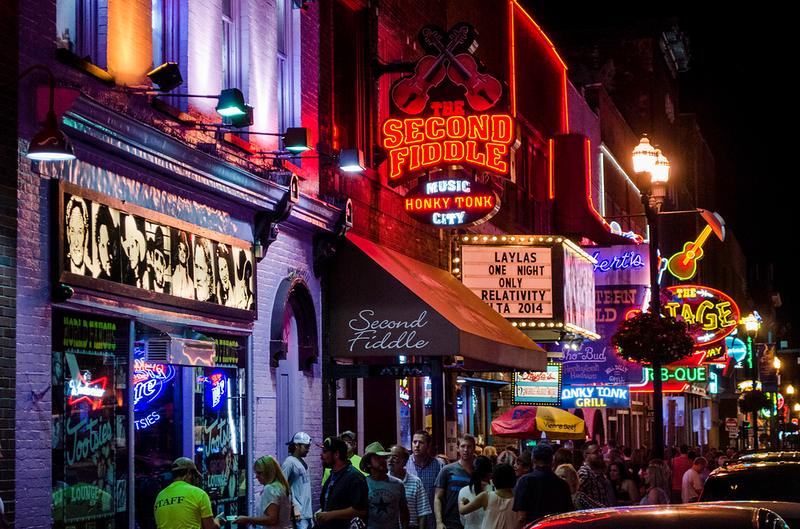 While vertical construction commences at an impressive pace, throngs of tourists have exceeded the capacity of sidewalks along Nashville’s popular Lower Broadway area. A coalition led by Nashville’s Metropolitan Planning and Public Works departments along with Nashville Civic Design Center, Gehl Studio and RPM Transportation Consultants has sought to enhance mobility options along Lower Broad by unlocking the power of tactical urbanism to test and refine concepts before committing to a long term infrastructure solution. Broadway is a major arterial roadway in Nashville, beginning downtown along the banks of the Cumberland River and extending South through the campus of Vanderbilt University. 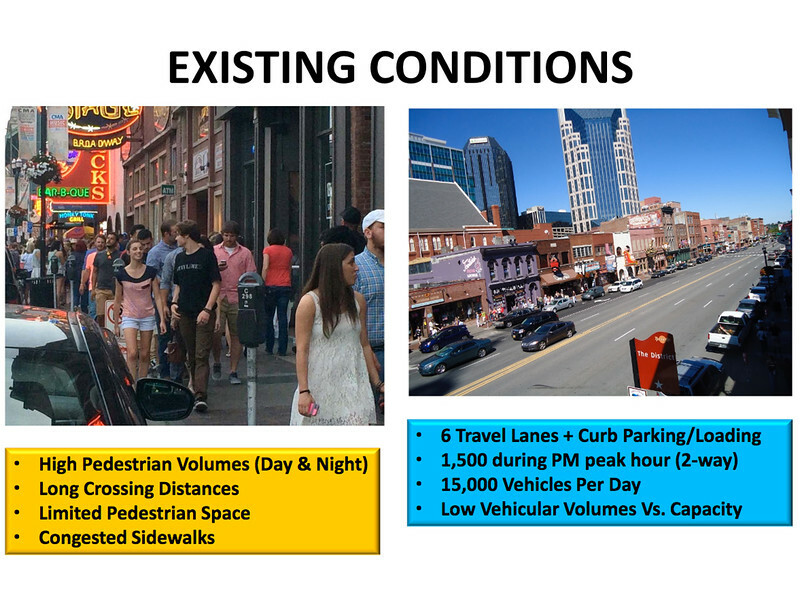 Most of Broadway carries a high volume of vehicular traffic, connecting several major Nashville neighborhoods to downtown and beyond with access to Interstates 40 and 65. The portion known as Lower Broadway is a famed entertainment district located between First and Fifth Avenues. This section is filled with tourists on any given day, and serves as a major economic engine to Nashville’s economy. Lately, capacity and safety issues have led business owners and public officials to come together and identify long-term, sustainable solutions to balance the needs of both pedestrians and vehicular traffic. Roughly 16,000 pedestrians pass through Lower Broadway each day. 15,000 vehicles use this section daily, while an average of 21,000 vehicles pass through the busy intersection at Broadway and 5th Avenue each day. Between 5th and 1st Avenue, Broadway featured 6 traffic lanes, an additional two lanes for on-street parking and loading zones and two roughly 10’-wide sidewalks. 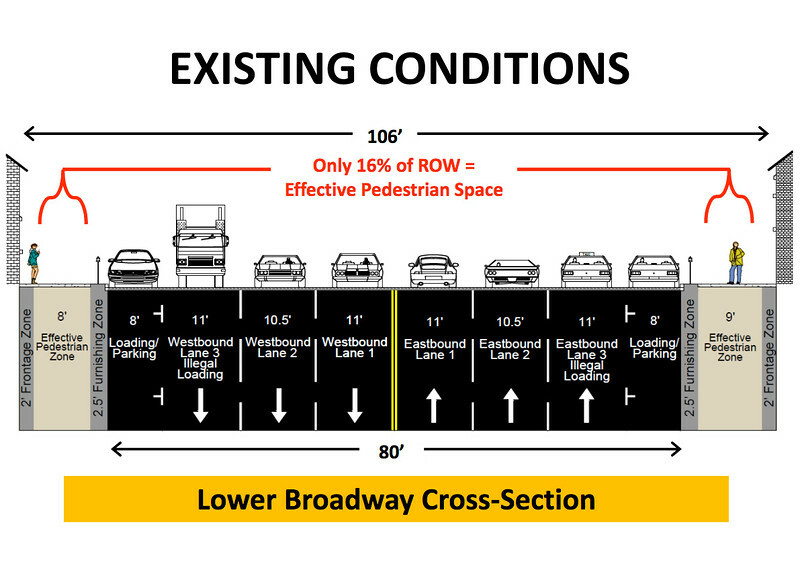 While Lower Broadway featured excess vehicular capacity, redesigning this stretch of the road would still need to account for vehicular movement critical to downtown business owners- loading zones, taxi pickup areas, transit facilities, etc.